21Nova is operated by WHG (International) Limited, a company registered in Gibraltar. WHG (International) Limited is licenced and regulated by the Gambling Commission(License Number: 000-039225 R-319373-001) for customers in Great Britain, and licenced by the Gibraltar Government and regulated by the Gibraltar Gambling Commissioner(licence nos. 034 & 042) for all other customers. The registered office of WHG (International) Limited is at 6/1 Waterport Place, Gibraltar, with registered company number 99191. 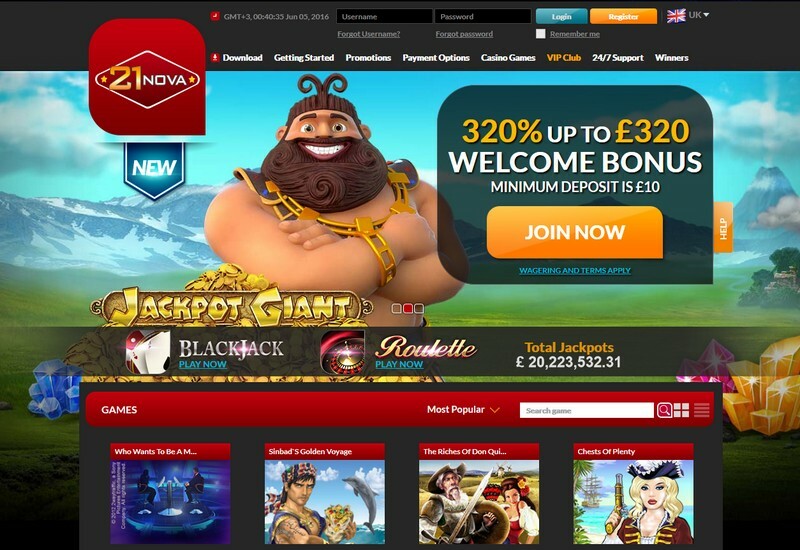 21Nova Casino was originally launched in 2006 by Crown Solution Gaming. At that time, the site was titled 32 Vegas. In 2009, this casino joined the William Hill family and was rebranded after a long legal battle with another online casino that held a similar name. With an extensive library of over 350 games, powered by Playtech Casino Software, 21Nova is able to offer its punters an array of games including live dealer games, progressive jackpot slots, licensed scratch cards, and several exclusive table and video poker games. This casino is open to players in select countries. At this time, it does not allow members from an extensive list of countries which includes the United States, Hong Kong, Australia, and France. At this casino, you will find more deposit and payout options than you can shake a stick at. All deposit options also come with a reload bonus that can be applied anytime you do not use another deposit bonus. When you log into your cashier, you will find the options available for your country and accepted currency as well as the relevant minimum and maximums. All players must deposit a minimum of $20 (or currency equivalent) in order to claim any bonus. What deposit options are available? Payouts have a pending period of 4 business days, regardless of source. An additional 24 hours is required to process the payment before the 1 to 21 days processing time before your funds are received. There is no maximum withdrawal amount per day or week, but transactions are limited to $10,000 or currency equivalent. There is no minimum withdrawal amount except for on bank draft which has a minimum of $100. All withdrawals are free except Bank Draft Express which has a courier fee applied. Neteller, PayPal, Skrill, ClickAndBuy, InstaDebit, ECO Account for a processing time of 24 hours. Visa or EntroPay with a processing time of 4 to 7 business days. Web Money, Local Bank Transfer, Bank Draft Express have a processing time of 2 or more business days. Bank Draft will take between 14 and 21 days to process. 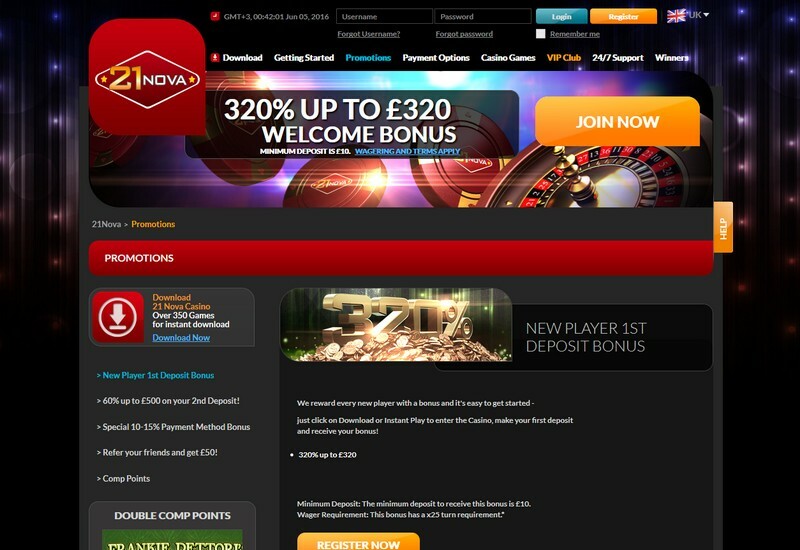 New players to 21Nova casino are invited to cash in on the 320% match casino bonus up to $320 on their first deposit. This bonus requires a minimum deposit of $20 and has a wagering requirement of 12x for the deposit and bonus amount. What are the wagering contributions of games at this site? 100% for online slots games and Scratch Cards; as well as any game not listed in other categories. 25% for All varieties of Pai Go, Red Dog, Let it ride, Casino Hold’em and Roulette. 20% for All Varieties of Baccarat, Blackjack, Stravaganza, Craps, Sic Bo, and Video Poker. 5% for Casino War, Lucky Wheel, Blackjack Switch and Pontoon. 0% for Double options on Video Poker and Slots. For the second deposit, players may also redeem 60% up to $500 with a 12x rollover requirement and a minimum of $20 deposited. Alternatively, every deposit method offers an additional 10% or 15% bonus, depending on the option. This online casino offers regular promotions for the short term as well as exclusive promotions direct to players based on their wagering activity. In addition to these few bonuses, players will also be rewarded for referring a friend when that friend deposits at least $50. The Refer a Friend Bonus is $50 and carries a 12x rollover. Welcome to the Club21 Loyalty Program – 21Novas version of a VIP club. As a member, you will have access to exclusive perks like deposit bonuses and double comp points. Players will earn 4 points for every $1 wagered, to start. This rate is increased as you progress through the VIP levels. Perks for this program include special gifts for birthdays and holidays, invitations to VIP events, and higher betting limits. 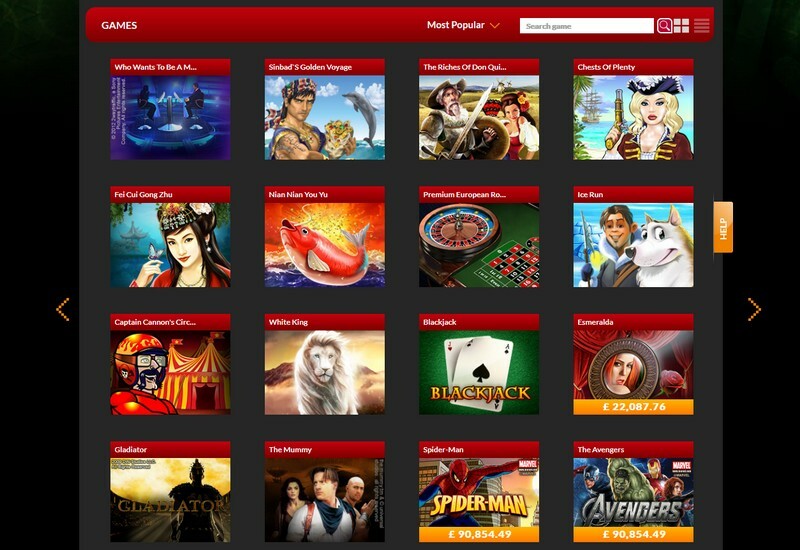 21Nova offers players an extensive library of 350 games in their downloadable casino. There is no online instant play available at this time. The selection of games is vast but not repetitive and offers a little something for recreational and serious players alike. Overall, the quality of most popular table games is top-notch although there are some weak spots in the development which we outlined below. Slots and slots for miles is what you’ll find in the casino library. Around 1/3 of the selection is classic 3-reel video slots games which include names that Playtech is known for like Alchemists Lab Slots. For classic slots, the quality is par for the course. We won’t say they are anything spectacular but they play well and are not too outdated. The video slot games are where it’s really at, however. Players can choose from over 100 different options which includes the popular 50-line Fantastic Four themed slots and several progressives like Monty Python’s Spamalot and Gladiator Jackpot. Games that carry a Marvel licensed character like the Hulk or the Avengers are the best quality out of the bunch. There are dozens of these to choose from online in the slots category, but also in other areas of the casino. Many online casinos only offer a handful of alternative games but that is not the case here. With a selection powered by Playtech, you will find about a dozen different options for scratch cards which offer leisurely play and the potential for fast cash. There are several licensed themes in this category as well like The Mummy and Iron Man. Additionally, you will find a few varieties of video bingo, keno, and miscellaneous card games. One of the best new features to come to online casinos in recent years is casino games with live dealer. Playtech was at the forefront of this development and currently offers several different options of live play streaming. All games feature highly attractive hosts and stream with ease to your computer making for a true real-to-life experience. Take your pick of various blackjack offers and other table games like French Roulette, Ultimate Live Blackjack and Exclusive Roulette Pro. The table game quality is so-so for this casino. It is clearly in need of some updating to compete with other developers. The games do play smoothly and offer casino-like audio sounds. The table selection is also larger than what we typically find with around a dozen different games to choose from. In addition to the classics like European Roulette, you will find pro games, Blackjack Surrender, Tequila Poker, and Stravaganza. The selection of video poker games only adds to the well-rounded selection at this site. Players can try their luck at all the classic favorites like Jacks or Better or they can dabble in some of the more exclusive games you don’t find at other sites like 2 Ways Royal. Games can be played up to 50 hands and feature average-level graphics. Some of the games are harder to view on tired eyes than others. On the scale of all games offered by this site, we would say that the video poker selection is at the middle of the road in terms of quality. If you are really feeling lucky, play a few rounds of Jacks or Better Progressive and see if you can snag a portion of the mega jackpot. Does this site have a mobile casino? Neither a mobile casino application or mobile play are available with this site. What casino software is used at this site? Playtech casino software is widely considered the crème-de-la-crème of platforms. The company is located in Cyprus and is currently the largest publically traded software developer. Founded in 1998, this company has made it a goal to continually offer the best and largest selection of games in their casino client. The company offers a full array of games including bingo, video poker, live dealer games, mobile games, slots, and numerous licensing agreements with Hollywood brands like Marvel. Who tests 21Nova for fairness? The premier testing service offered by Gaming Laboratories International is used by this site. GLI was first established in New Jersey in 1989. During its existence, it has grown to have facilities in 14 different countries and covers over 450 jurisdictions. The company not only handles fairness and random number testing for online casino software but also for riverboat, Indian, and land-based casinos. It is currently the only testing company that is internationally accredited and is recognized as being the best in the industry.